Sushi making is an art. A beautiful, delicious art. 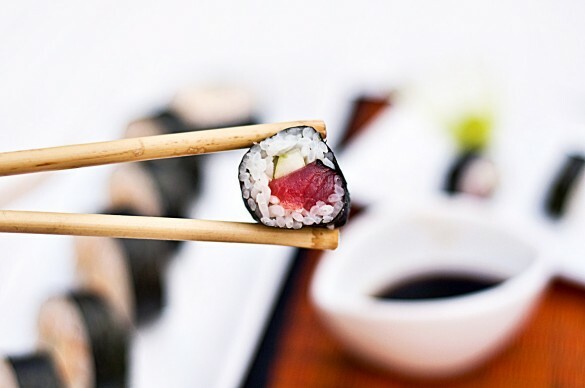 I’m not going to sit here and pretend that one little post will ever get anyone near the magic that happens behind a real sushi counter, but I WILL tell you that making a simple roll is easy enough to do at home. If you dare. 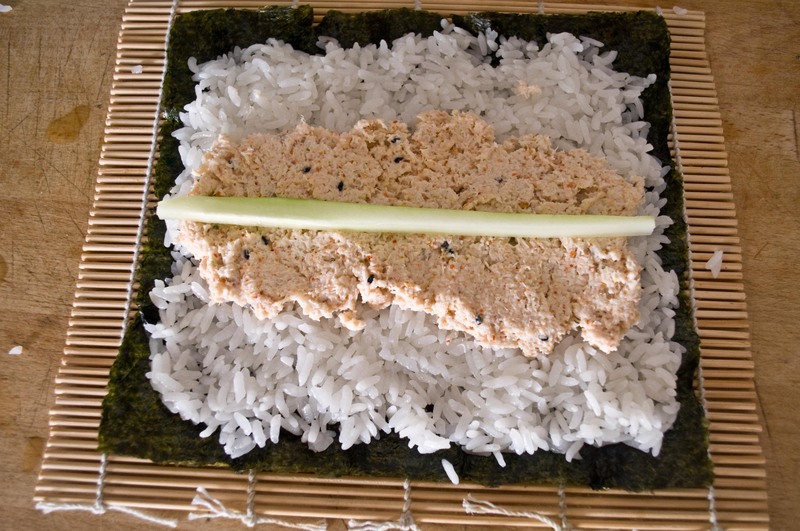 Sushi rice isn’t like your every day rice and isn’t cooked the same way. 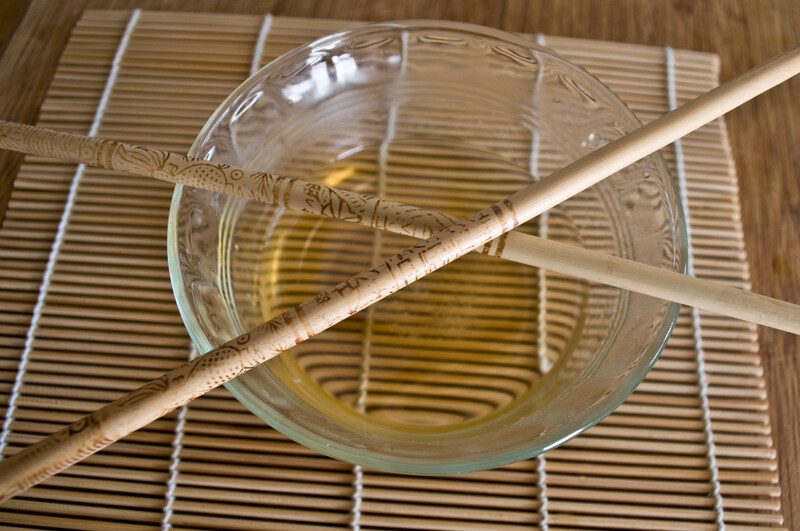 The cooking method is different, and it is finished with a shot of sake (optional) and a vinegar dressing. 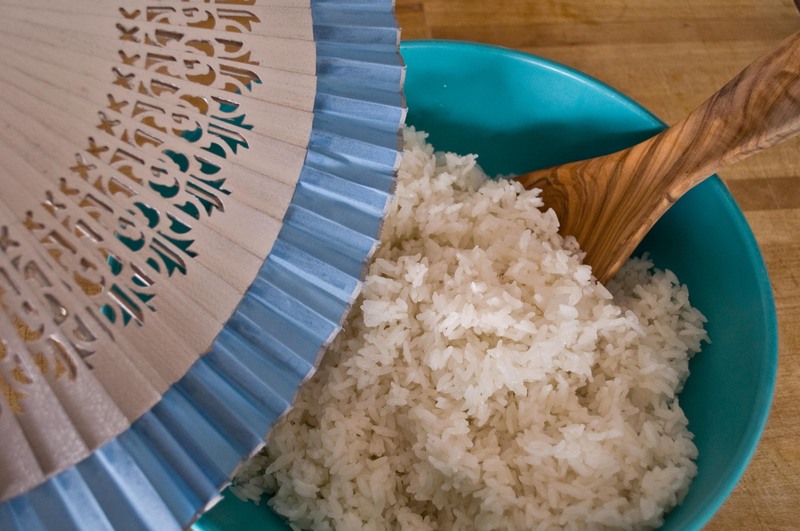 Put the rice in a large bowl and cover with cold tap water. Swirl with your hands to remove any debris. Repeat two more times. By the third time, the water should be much less cloudy. 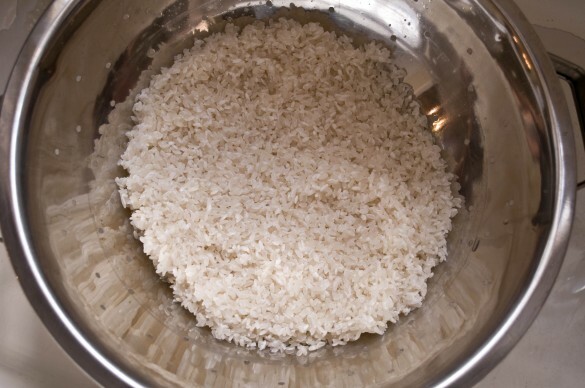 Put rice in a colander and allow to drain and dry, about 30 minutes. Now here is where things get a little wierd. By all accounts, in my previous rice-cookin past, the ratio is 1 part rice to 2 parts water, right? Well, not in sushi land. 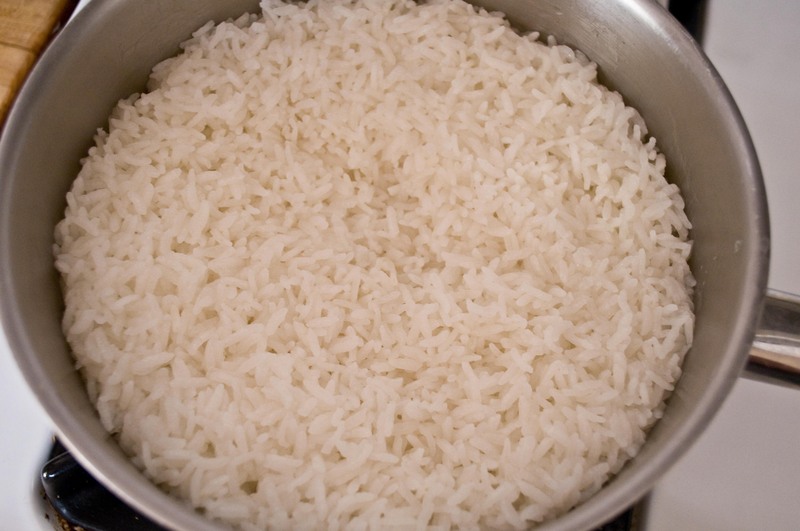 Put your 3 cups of rice in a large sauce pan and cover with 3 cups of water. Yep, thats 1 part to 1 part. Don’t worry, it all works out. 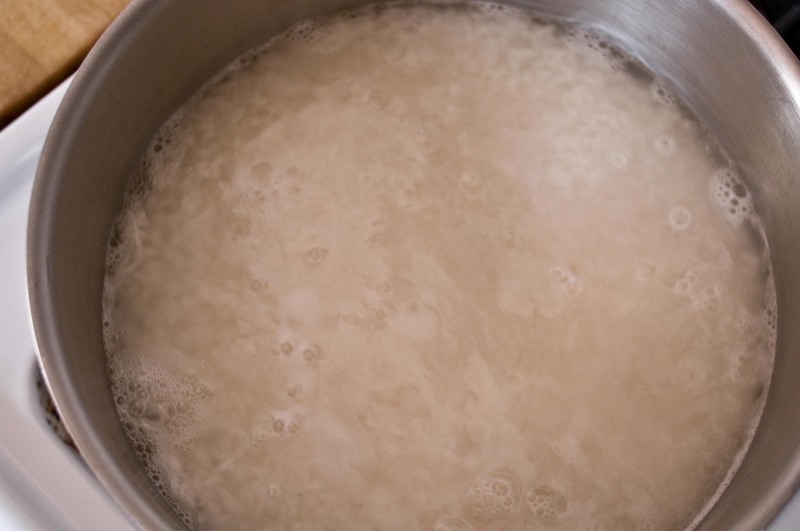 Cover and allow to boil over high heat (resist the urge to turn the heat down) for three minutes. Then turn the heat to medium and cook for an an additional 5 minutes (I sure hope you have a kitchen timer). Then turn the heat to low and cook for another 8 minutes. There should be no visible water left. If you have a shot of Sake, drizzle it over the rice at this point. If you don’t have any Sake, don’t worry about. Remove from heat. 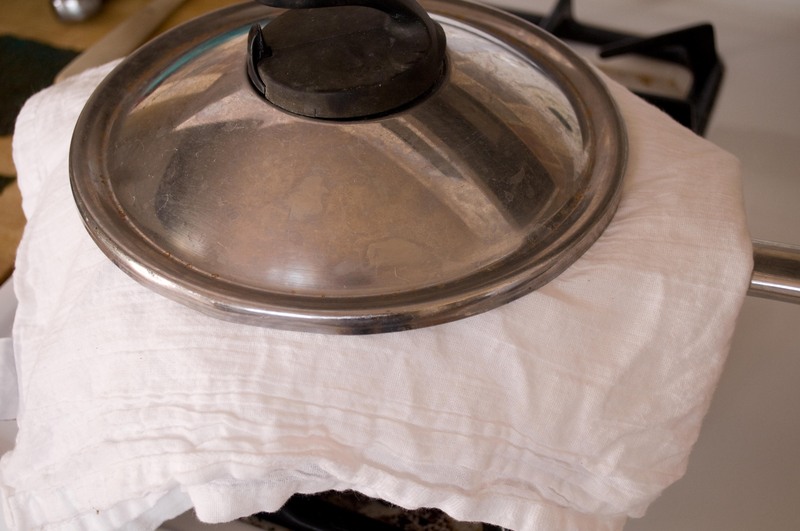 Cover with a towel or a cheese cloth, put the lid back on and allow to rest for ten minutes. While your rice is cooking, make the dressing. 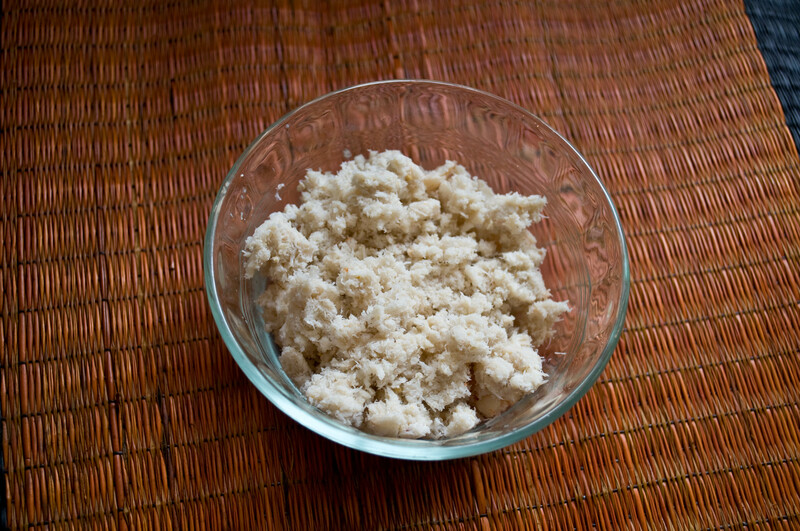 Combine the vinegar, salt and sugar in a small bowl and microwave on high for 30 seconds. Stir until dissolved and allow to cool. Once the rice has rested, transfer to a large, flat bottom bowl. 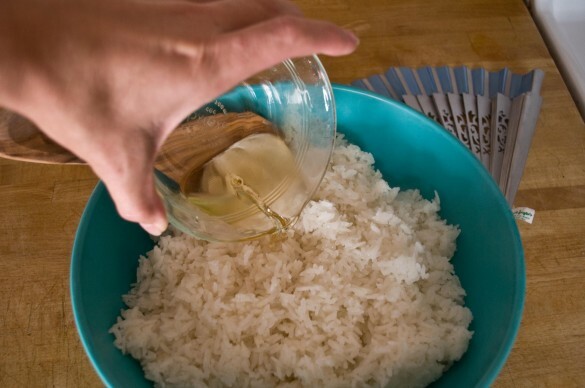 Pour the dressing over the rice. Stir the rice with a wooden spoon to distribute the dressing evenly, while fanning with a fan to cool. If you don’t have a fan a piece of cardboard will work just fine. Repeat until rice is at body temperature. First, lets talk about fish. For this post I made two kinds of sushi, a basic Ahi Tuna Roll and a Spicy Crab roll. You can fill your sushi with just about anything you want, including other types of meat and vegetables. If you want to use raw fish, buy the best stuff you can find, really, this is no place to bargain shop. Go to the best fish market in your town and asked what they have that is Sashimi grade and of that, what is the freshest and highest quality. Don’t go in with your heart set on a certain kind of fish, you may not get the best quality. If you really want Ahi, but they just had a beautiful Yellow Tail come in, get that. You don’t need a lot, I was able to make 5 rolls from less than a half a pound of Ahi. 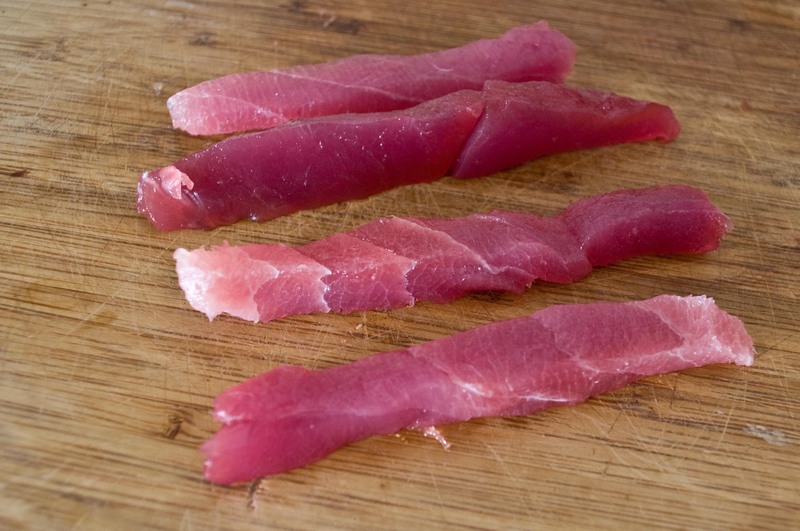 Cut your fish into long thin strips, the width of about your pinky. 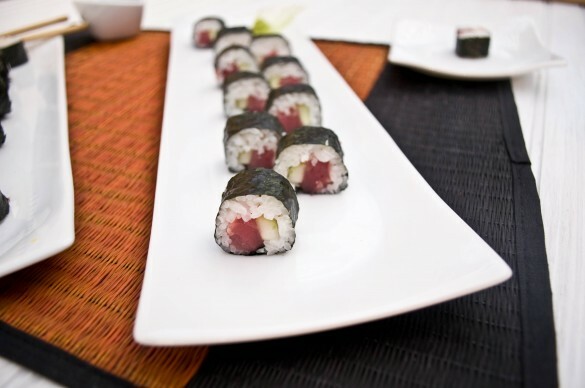 If you don’t have a long enough piece of fish to cover the entire length of the roll, you can use segments. You’ll will need sheets of Nori and a bamboo rolling mat. Most large chain grocery stores carry both of those in their Asian sections. You can also try your local Japanese markets. 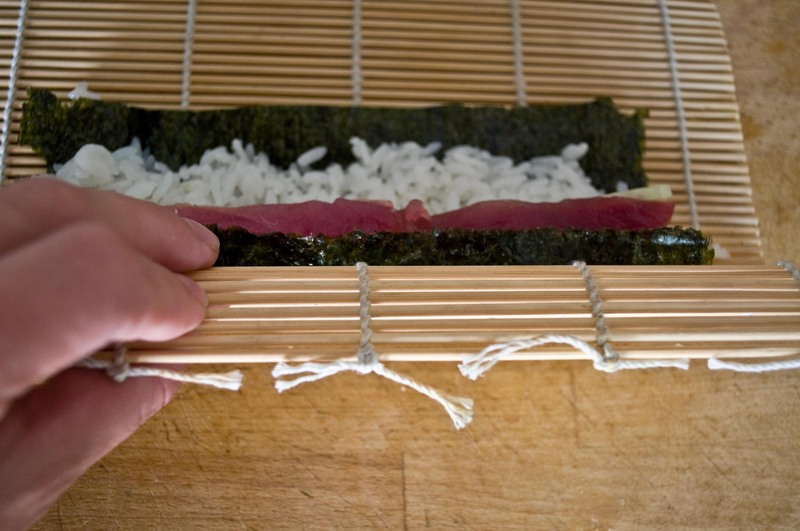 For the smaller, basic Ahi roll, use one sheet of Nori, cut in half width-wise. Place this on your bamboo rolling mat. You will NEED a small bowl of cold water. 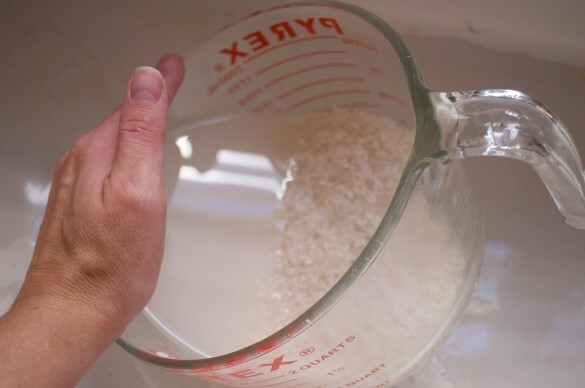 This is so that the very sticky rice doesn’t stick to your fingers. 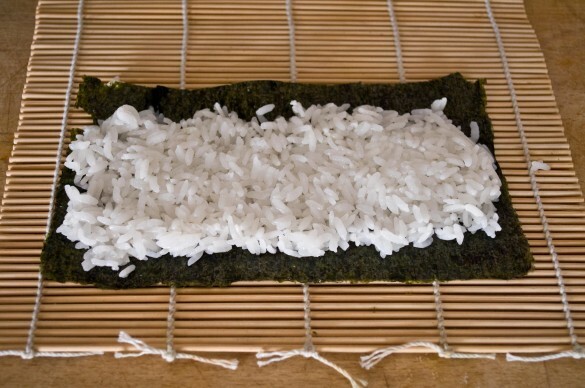 Dip your fingers, as needed, into the water and transfer enough rice to make a thin layer of rice over the sheet of Nori while leaving a small blank margin along all sides. Place your thin strips of fish in the center. I also placed a long thin strip of cucumber for a little crunch. Roll away from you, using the mat as a guide. Apply firm pressure to shape the roll. 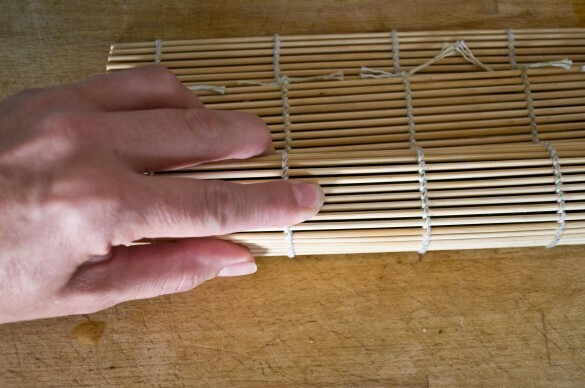 While the roll is still in the bamboo mat, form into a square with firm pressure. This is much more accessible and easier to find in most of the United States, regardless of how far you are from the ocean. This is a basic spicy crab recipe, with sour cream as a substitute for the more commonly used mayonaise. If you want to use mayo, it will work just fine as well. I just have a very strong aversion to mayo in general, store bough being at the top of my hit list. 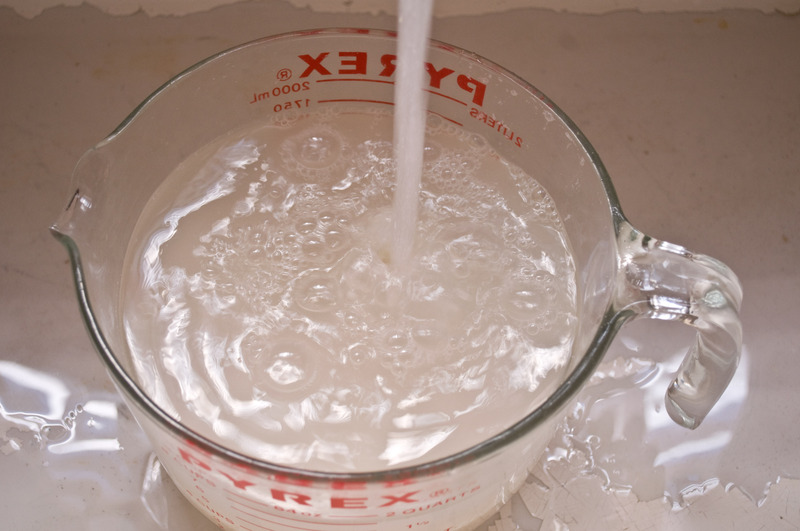 Squeeze the crab meat to remove as much water as you can. This will help your filling to stay together and not become a soupy mess. Add the sour cream, nanami and salt and stir to combine. Use a full sheet of Nori for this roll, but use the same steps as with the Ahi roll. 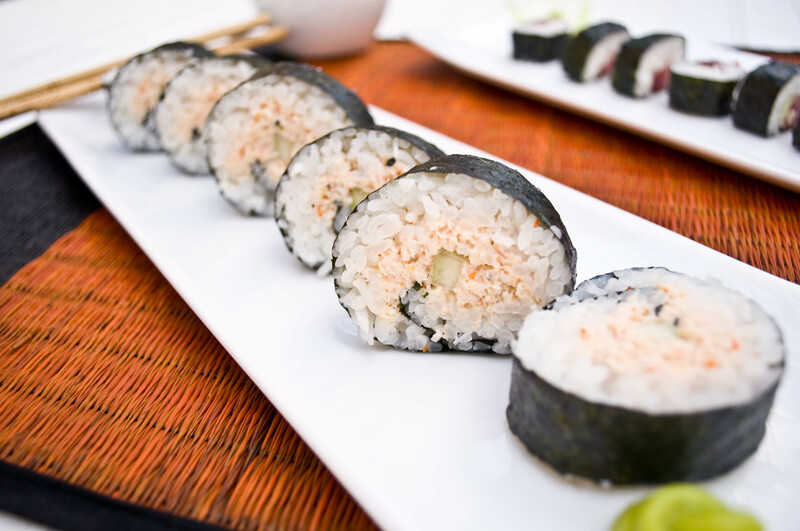 I used a thin strip of cucumber for this roll as well. Just because I had it already cut and I wanted to add a little crunch. 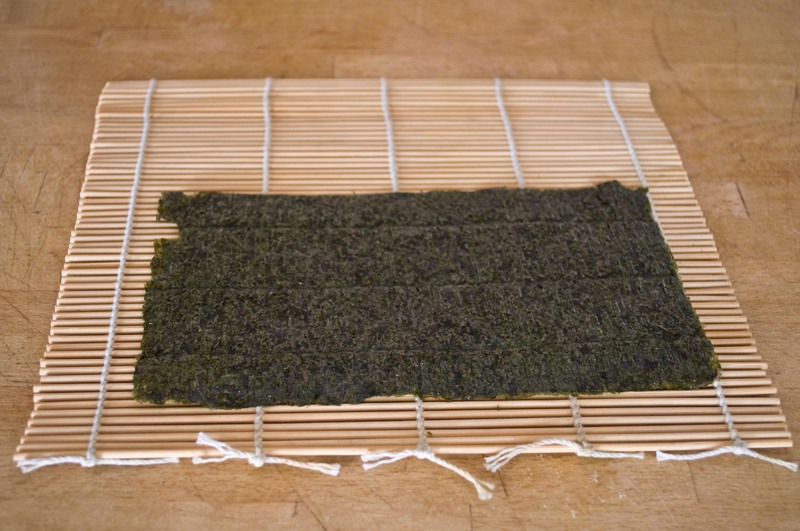 Roll the same as before, but there is no need to make the larger rolls square. 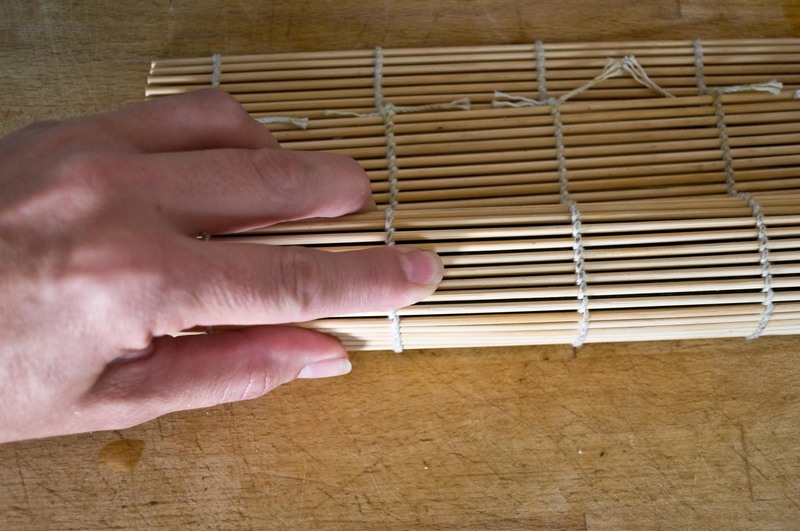 Use a very sharp knife to cut the rolls, you may need to run the knife under hot water in between cuts. Whats up with Wasabi?? 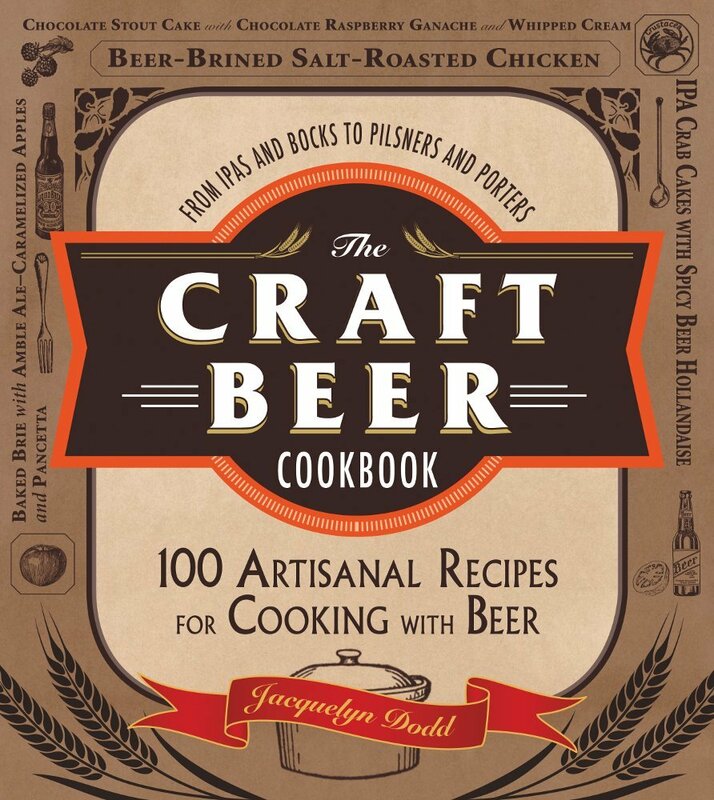 There are two kinds that are pretty readily available at most grocery stores. The squeeze tube kind and the powder kind that you mix with water. I find the squeeze tube kind to have an odd, over powering taste. I very much prefer the powder kind. You now know how to make sushi. Go impress your friends. I’m so excited you posted this! I bought some sushi grade yellowfin tuna this weekend and made ahi poke. I was considering whether or not to experiment with rolls, too. Yum! I was just saying that I wanted to learn how to do this today!! Thank you!! Great post! 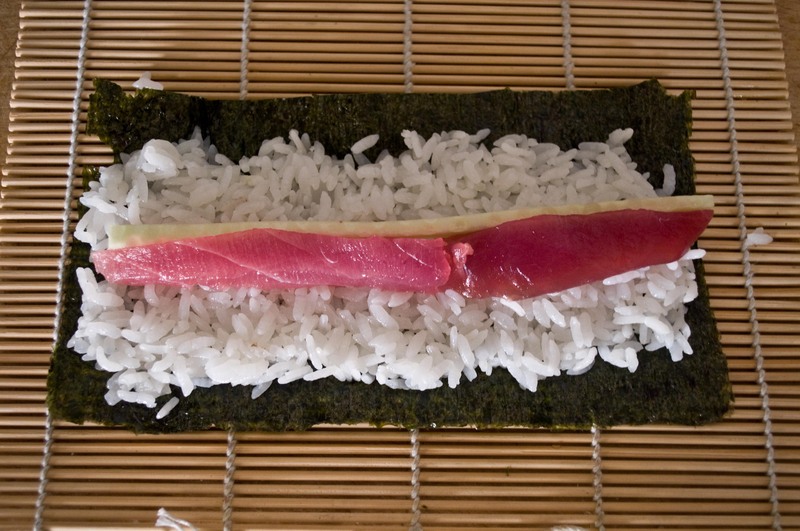 Your step-by-step photos are so helpful on how to make sushi! Your sushi came out great! Looks so Delicious.. Love your steps photos too.. I am now, officially, craving sushi. Another gorgeous post! 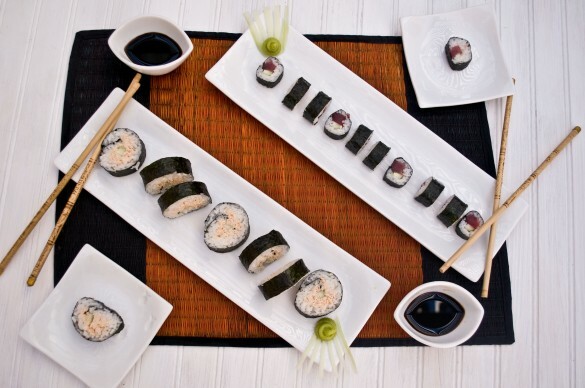 It’s the rolling and the slicing that scares me:)But your sushi looks great! I should give sushi rolling another try. You should! Using the mat makes the rolling pretty easy. 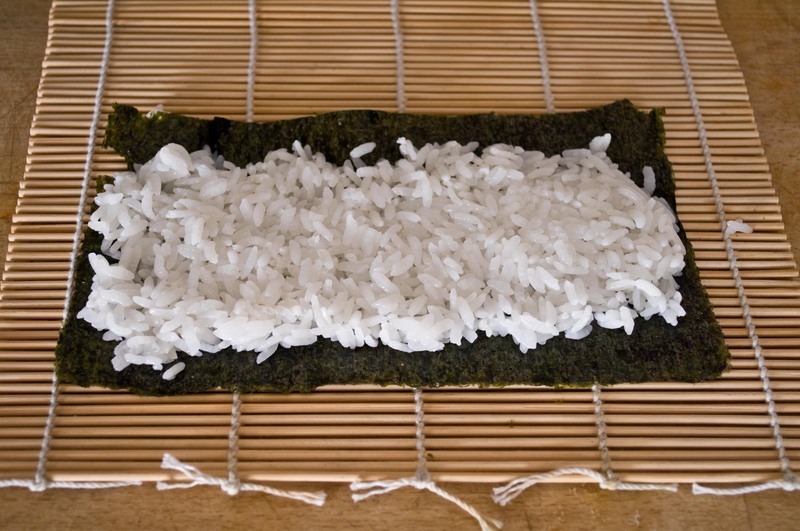 Slicing just takes a really sharp knife and you will probably have to rinse the sticky rice off between slices.